Well here it is… the rest of a typical week on our beloved CSA: Monroe Organic Farms. Thanks again to Jacquie for letting me share this with you all, and to my buddy Rachel for the great pictures! We are now on Friday and Saturday of our general daily work week description. We plant extra produce, more than what the CSA needs, just in case there is a weather related or insect problem. We attend four farmers markets over the weekend. If there is a production problem, produce would be taken away from the farmers markets. We are hoping the CSA will not feel it. Think of it as an insurance policy for your CSA. This is also how you get your extras to pick for freezing & canning. We have also found that if we do not pick produce just about every day, your zucchinis would be enormous, your tomatoes would be overripe, etc.! In general, your produce would not look as nice! Whatever produce the membership is not using, we take to the farmers markets. The employees start picking Thursday and will continue until noon on Friday for the markets. After lunch, they will wash any produce with excessive amounts of dirt on it and bunch crops such as carrots & beets. Once this is completed, Jerry gets out the worksheet for loading the trucks. We keep track of what has been placed on each truck. The truck will also need tables, tents, table clothes, plastic bags, pens, paper, signs with prices & baskets for display. On Friday, Jerry again, begins his day with changing his water. If he can get into fields, he likes to mow the weeds. This cannot be done in fields with vining crops, such as, pumpkins, watermelon and muskmelon, or with tall crops such as tomatoes & corn. But he likes to keep them down around his irrigations ditches and in as many fields as he can. I can tell you this doesn’t happen every week and we are lucky if he can get to it once a month! The animal pens need to be checked at least every other week. Fencing never seems to stay where you want it because of wind, predators and weeds. 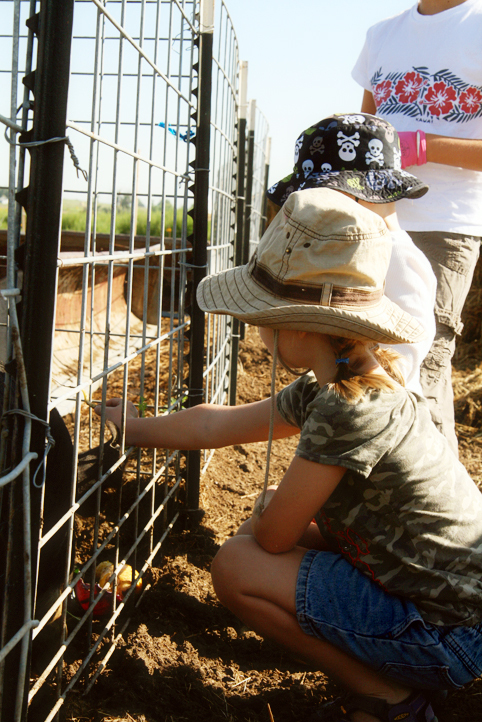 We spend quite a bit of time checking fencing and fixing it. It is amazing how quickly the animals figure out the electric fence is down! Everyone leaves Saturday morning somewhere between 4:30 and 5:30 in the morning for their destination. We attend the Cherry Creek Farmers Market, the Boulder Farmers Market and the Longmont Farmers Market on Saturday. It will take about one hour to get to a farmers market and about 1 ½ to 2 hours to set up. We will sell for 6 hours then load up anything that did not sell or give it to the Food Bank. This takes approximately one hour. When the trucks come back from Saturday farmers markets, we unload all the returning produce. This is noted on the worksheet. 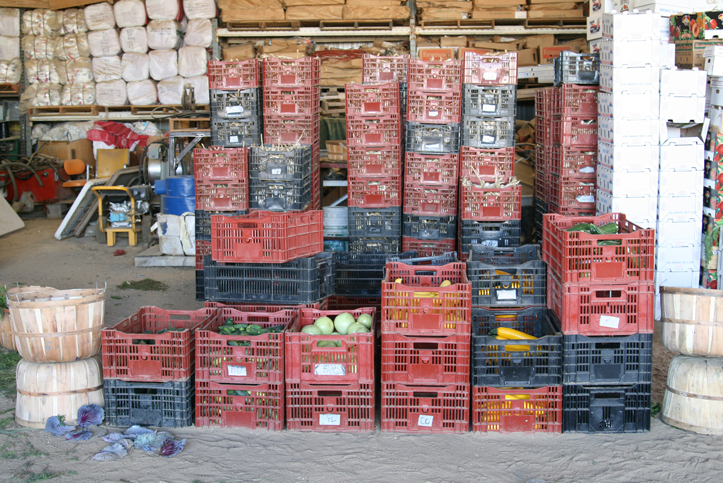 The produce is sorted and reloaded onto one truck. Anything that is determined to not be “good enough” for market is fed to the animals. Employees have picked just a little produce on Saturday to fill in what was sold on Sat. They have also changed Jerry’s water for him while he is at market. Half the employees have Sat. off; the other half has Sun. off. The day ends at 5 pm. for me and Jerry will be done as soon as he has checked his water. Kyle goes to the Ft. Collins Farmers Market on Sunday. He leaves at 9 am. and returns about 5 pm. And once again, we will give excess produce to the Food Bank at the end of the day & bring back what will be fed to the animals. Crops such as potatoes can be kept until the next weekend. Our biggest money makers are the potatoes and onions. The reason; we have these crops from the very beginning until the very end of the season. The customer favorites, however, are the strawberries, melons, tomatoes and beans. This concludes our general daily work week. Of course there are so many other things we do during the week; so many they cannot be listed. But it gives you a good idea of what happens on a regular basis. Jerry and I work 7 days a week, March through November, then we slow down to 5 days a week during the winter. We try to take a week or two off during Christmas. Sometimes it happens and sometimes it doesn’t! I hope you have enjoyed the farm posts! Rach shared so many great pictures and I didn’t get to include them all… but keep an eye out, with her permission, I might just attach them to other farm posts in the future!